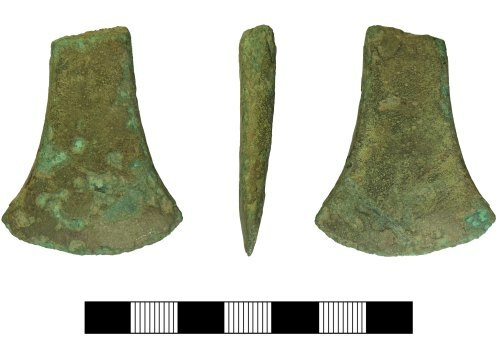 A fragment of a thin cast copper alloy Bronze Age axehead, of flat type and dating from the Early Bronze Age (c. 2200-1700 BC). The axehead has curved, diverging sides with a curved and splayed cutting edge. The axe has a rectangular profile and is 16.4mm wide at the break. There is a slight curve to the side profile of the body of the axe which suggests it had become slightly bent, perhaps in use and perhaps leading to the breakage.